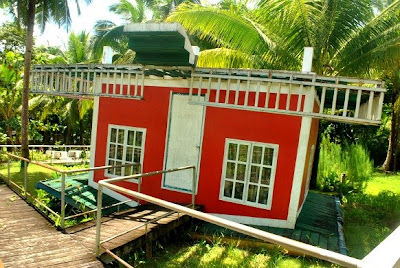 The chilled-out Eastern Samar remains an undiscovered gem for adventure travelers and beach worshippers. The airports in Borongan and Guiuan are still in the works to support the commercial and tourism industry so to get here you have to take a 4- 6 hour bus or van ride from Western Samar or Tacloban. Eastern Samar may feel like more of an adventure than you bargained for but endure the craggy roads and you will surely marvel at the paradise-like beaches, caves and waterfalls scattered in the province. A more accessible area of Eastern Samar is the bucolic town of Taft -roughly 3 hour bus ride from Catbalogan city. It is largely un-touristy, but it has a few solid accommodation options to speak of. 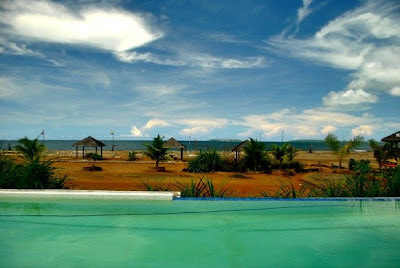 Getting here is a life-enhancing antidote to the hurried lifestyle of neighboring Catbalogan. A local favorite is Dangkalan Beach Resort usually enjoyed by local surfers during the season of big swells. Many kids still wearing their uniform actually come here to play during their break. There is a small playground with a Jollibee-like mascot, huge sneakers, and a tree house. But the most photographed is the eccentric peach upside down videoke bar. The resort has a manicured garden with decent accommodation. The golden brown beach shore is dappled with nipa cottages overlooking the nearby Makati Island. Last bus leaves at 2 PM going back to Catbalogan. 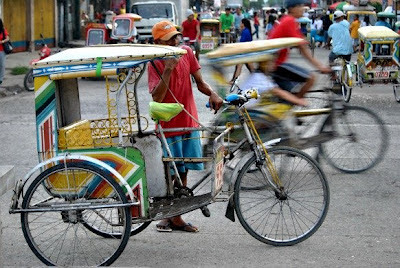 The bustling capital of Western Samar – Catbalogan, can easily be navigated by foot or by riding colorful big-wheeled pedicabs which is quite a common scene in the province. Finding an accommodation here is no headache, same with restaurants, major commercial establishments and banks. But getting to the natural attractions of the province like its majestic caves and waterfalls is difficult since there’s not much information online either on how to get to Catbalogan’s beaches and waterfalls as well as the caves of Samar via public transportation something that could help boosts tourism in the province. There is only one known tour company that offers spelunking here with caving equipment, guides and permits included but their tour rates mostly caters to foreigners. 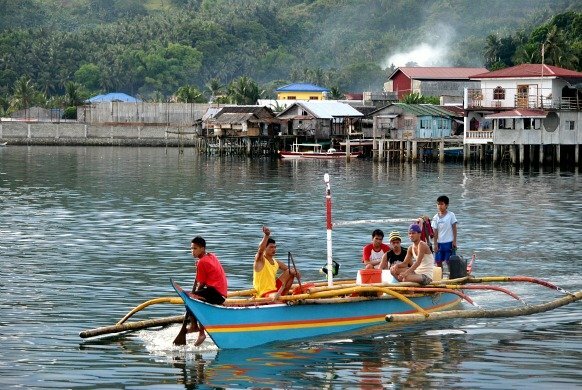 Nevertheless, Catbalogan city has a handful tourist spots within the commercial hub. Visit the old church of St. Bartholomew and the Pieta Park which is dedicated to the thousands of passengers who perished in one of the world's worst ferry disasters in December 1987. Do check out the eccentric monument of Jose Rizal (the national hero of the Philippines) with three naked men carrying Rizal and his 2 famed novels (Noli Me Tangere and El Filibusterismo) at the Catbalogan City Plaza. Head to the capitol of Samar province and see the Obelisk featuring the 4 major events in Samar’s history - the decree of Queen Isabella on August 11, 1841 declaring Samar as an independent province, the 1901 Balangiga Massacre ; the 1649 Agustin Sumoroy Rebellion and the arrival of the first Jesuit missionaries to Samar in 1956. Stroll along the bridge near St. Mary's College for a glimpse of the stilt houses standing shoulder to shoulder near the coast. Some of Catbalogan's notable natural attractions are Bangon Falls, Cal-Apog Beach and Buri Beach. Ride a bus bound to Dolores or Borongan from Catbalogan. Travel time is roughly 3 hours. Ask the driver to drop you near Dangkalan Beach Resort. It can be reached by foot from the main road. Last bus returns to Catbalogan at 2PM. Airphil flies to Calbayog city from Manila. From Calbayog, take a van bound to Catbalogan, travel time is 1 hour. There are also buses and vans from Tacloban and Catarman as well as ferry buses from Allen, Surigao and Manila that passes by Catbalogan city. Loved to hear about this beautiful place..I would loved to visit this place and enjoy the scenic beauty.